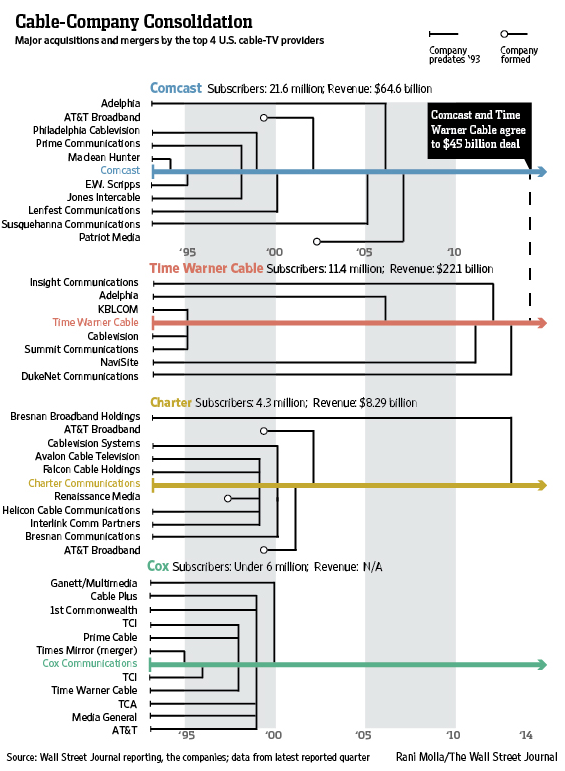 The proposed $45 billion merger between Comcast and Time Warner Cable would unite the two largest U.S. cable-television and broadband internet providers, and — as this Wall Street Journal chart nicely illustrates — continue a decades-long consolidation trend in cable. For several decades, when the main competition was broadcast television (and, sometimes, local satellite-TV companies), cable providers were largely local and regional operations. But in recent years, as subscriber rates plateaued, new competitors emerged (DirecTV, Verizon, Netflix) and costly new digital technology became necessary to stay relevant, the largest players began rolling up the smaller ones. The goal wasn’t so much to eliminate competition (thanks to local franchise agreements, cable operators typically don’t compete against one another) as to achieve economies of scale and bargaining power — especially with content producers. Should the Comcast-Time Warner Cable deal go through, the combined company would have some 33 million subscribers, though Comcast has said it’s willing to divest up to 3 million of its customers to win regulatory approval. Though it would be by far the biggest cable and broadband company, traditional cable subscriber numbers have been falling as viewers turn to companies like Netflix and Hulu. Much of the regulatory scrutiny, in fact, likely will be aimed at the companies’ internet business.